Tito Puente is admired around the world for his influential, immortal body of work. His rhythms, his music and his contagious energy have united fans from different nationalities and cultures from around the globe. The strength of his artistry has transcended time and distance. Over the course of his impressive artistic career, Tito Puente was a perennial and prolific innovator of Latin Tropical music and Latin Jazz of the highest caliber. Now thanks to Sony Music Latin, we all get to enjoy the four signature and landmark albums, along with a fifth bonus album, that truly defined the "American Icon" and his golden era. 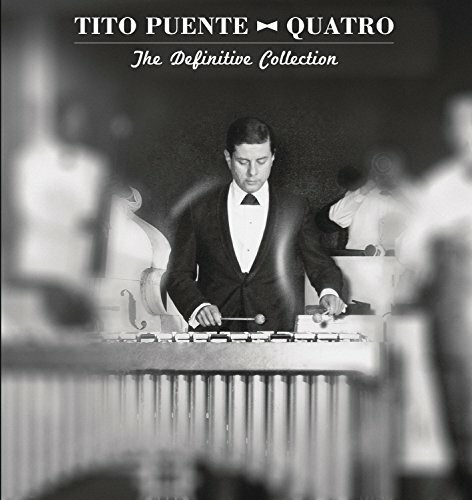 Quatro The Definitive Collection a 5 LP 180 gram Vinyl set that includes 57 songs, over 3 hours of music digitally re-mastered, informative liner notes written by Joe Conzo (curator & music historian and author of the book "Mambo Diablo My Journey with Tito Puent"), a close friend of Tito Puente. It also contains never-before published facts and more than 40 never before seen photos, plus previously unreleased artwork and alternate takes. Among the other highlights and most interesting, informative features of this collection are the quotes from a plethora of musicians, producers and others who personally knew and/or worked with Tito over the course of his six-decade musical career.